Whenever I complain about things going wrong in my life, my dad reminds me of the 100 theory.. In short, it is that each one of us has a total score of 100 for the various aspects of life( health, intelligence, looks, family, marriage, kids, money…etc).For each and every person out there, the total is always 100 . Some people score high in intelligence and family but on the other hand they are not doing so well in the looks department. Others have money and beauty but their marriage is falling apart or maybe they have a great family, money and looks but they are sick.. I have my days when I wish I had it all or when the longing for what I miss takes over.Then my dad reminds me of that theory and I feel a little better because I know that no matter how much I whine, deep down I wouldn’t exchange the blessings I have for the things that I miss. If I asked you to look at your life’s report card, what would you say?do you like what you see?the high? the low?would you have it any other way? 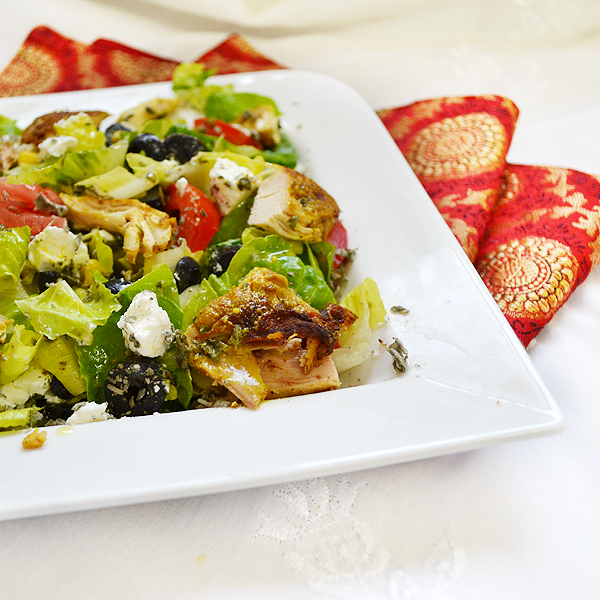 One of my favorite main dish salads is chicken souvlaki salad. It combines some of my favorite flavors in the Greek cuisine: Feta cheese, lemon juice, olives and olive oil with tangy garlicy chicken.I will share my recipe for chicken souvlaki sometime soon but today I am sharing a creation that came from craving greek salad and having left over tandoori chicken,a lucky coincidence if I may say so. Slowly drizzle the olive oil while whisking until the oil is incorporated. In a bowl toss the ingredients of the salad except for the cheese together and drizzle the salad dressing then toss the salad. Crumble the cheese on top of the salad and garnish with some dried oregano. One last thing before you’re off to make chicken salad 🙂 make sure to stop by Linda’s yummy blog, Savoring Every Bite, and check out her s Medjool Date and Walnut Bread that she’s cooked up for the Swanson’s Blogger Recipe Contest. Best of luck Linda! 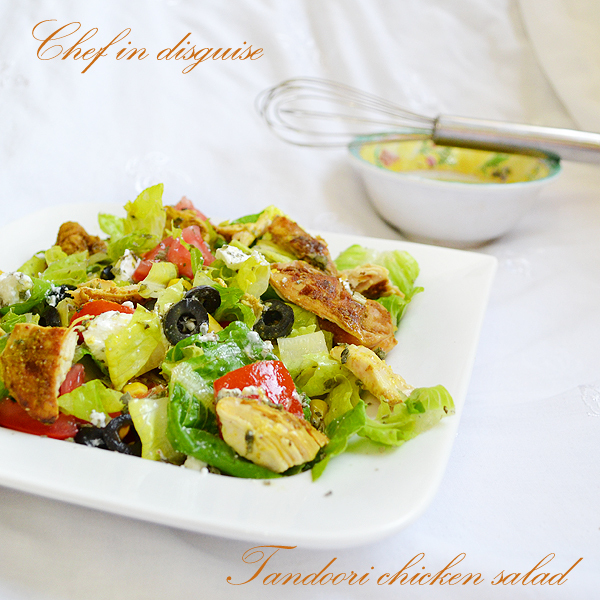 Posted in Chicken, Salad and tagged 100 theory, chicken salad, greek salad, left over, postaweek2011, recipe, salad dressing, Tandoori chicken. Bookmark the permalink. Well, if you’re happy at home, that’s the most important thing. But back to the salad, looks awesome. I have lots of oregano drying too. Yumeee, Really I like those such light and quick recipes. Thank you Sawsan. ….wooaa, slow down on me.. go write a novel. That’s such an awesome sentence, I just had to point it out… I was really impressed reading it. I find it SO hard to come up with decent words like that…. Good post, awesome recipe. Couldn’t get any better…. What great pictures! The salad sounds wonderful! Good theory your Dad has, puts everything in perspective! YUM! That salad looks amazing 🙂 Feta, olives, corn & chicken together, that is my kind of salad! Your tandoori chicken recipe looks delicious! It is one of the few Indian dishes that I order without fear at Indian restaurants. I’d love to make it at home and this salad would be the perfect dish to take advantage of the leftovers. Great post! Your father is a wise man. This is a great looking salad and the dressing is perfect! This could become a regular on my lunch table this summer. Love the 100 theory…helps to put life in perspective. I like your father´s theory – everything in life cannot possibly be perfect at once. And it´s good to take a step back and appreciate the things that are good even though some other things may not be quite where we want them to be. Love the recipe – the sort of salad that we very much enjoy. Do hope the children are settling back into the school routine. Your Dad has an interesting point. 🙂 When you look at life from that perspective, things make sense. As does your chicken salad. Delicious! Love me some chicken salad and this one looks like the best yet. I love the seasonings on the chicken and how it is delicious but also healthy! I am totally loving this salad! Fresh and scrumptious!! This reminds me of a salad I make with left over chicken. Yours is definitely looking much better and looks so refreshing! I like the 100 point theory, I think it rings very true. This salad looks delicious! I like your dad’s theory and I like that he gave it a handy name. This salad looks incredible, so tasty and refreshing! Look absolutely amazing..what a great chicken salad recipe! Well done..great photos too!!! 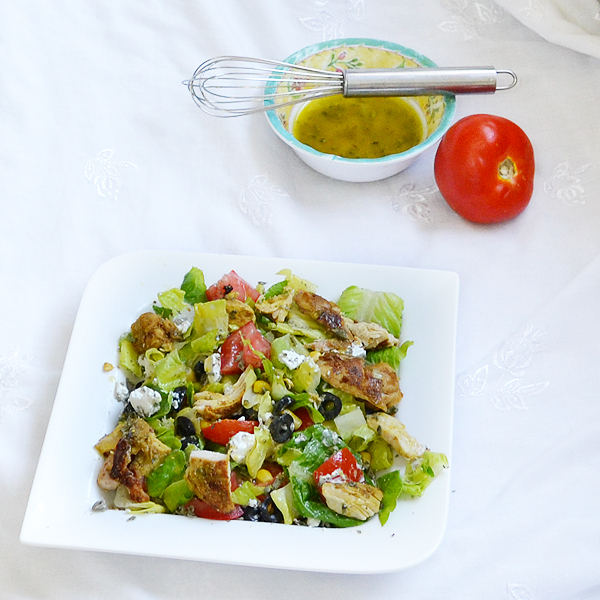 I love tandoori chicken and I love a nice greek salad. Combining the two sounds delicious.